What would you say motivates you to do what you do? While there are many things that motivate me, my inspiration is really a result of two equally important components: the values that were instilled in me by my parents to leave the world a better place, and a deep desire to create solutions that have a real impact on the business world. I was taught at an early age that I have a duty to serve my family, my community, and the greater world, and that every generation has a responsibility to do better than the previous one. My parents were extremely hard working and, through their own perseverance, taught me and my siblings the importance of leaving an impact and to making the world a better place. The second motivation is more professional in nature and is based on my passion to develop solutions that help businesses apply new ways of doing things to improve outcomes. I have never settled for traditional “status quo” approaches, and I cannot stand inefficiencies and/or applying “business as usual” methodologies. Instead, I always question the norm and, as a result, I've been very fortunate in my entrepreneurial journey. At Paxata, we share this same philosophy and began by seriously questioning why it was so difficult and inefficient to turn data into useful information. It was this very question that eventually led me and my colleagues to start Paxata and help define the data preparation space. Thanks to these connected and equally important motivations, Paxata is disrupting the $30 billion modern Enterprise Information Management (EIM) market and making it significantly easier and more efficient for business consumers to monetize their data assets. To summarize, I would say evolution led me to where I am today. And by evolution, I mean my development as an entrepreneur. This important milestone eventually led me to co-found Paxata, and ultimately becoming a CEO. Since I was 20 years old, I have aspired to lead an organization as a CEO and develop products that have a profound impact on a business’ success. From an entrepreneurial stand-point, I have always been drawn to information and have been a “data” guy all my life. Passion aside, this is one of the things I know really well. Even my undergraduate work at the University of Texas was in their Database Program. After graduation, I opted to work for a startup rather than a large company, so I could be exposed to a number of different organizational roles. As a result, I was able to be mentored by people who were also highly motivated to succeed. For instance, I was fortunate that at Verilog, the company that I started my career with, I was mentored by the CEO and Founder. Under his direction, he showed me how to do things the right way, and also exposed me to various strategies to use when things went wrong. From there, I went to business school and then on to management consulting where I really honed my skills of structured thinking and logic; all of which helped mold me into the executive I am today. At 29, when it was time to start my first company, I did not believe I had earned the right to take the helm but wanted to be a student of other chief executives. When I turned 40, and was more attune to the importance of one’s perseverance, humility, and self-assessment, I felt ready to take on the role of CEO and I started my second entrepreneurial journey by co-founding Paxata. At this time, I had worked directly for multiple private and publicly company CEOs, notably Vivek Randive, CEO and Founder of Tibco and Henning Kagermann, CEO at SAP. I saw a huge gap in the market and despite being offered to stay on at my then employer SAP in a role to run a large part of their business, I opted to put my efforts into developing not only the company but also a whole new market category. While others may have perceived this to be a risky endeavor, I firmly believed that analytics and data were going to disrupt the business world… but only if business consumers had a way to access and trust the information that was needed to generate these insights. I'm very, very fortunate that I have been able to fulfill my dream of becoming a CEO, but this is largely due to my ability to focus on the end-goal and combine that drive with my unwavering perseverance. I just don't take "no" for an answer. That's me; that's just how I am. I'm like a Timex watch--I may take a licking, but I keep on ticking. At the same time, I am also a realist. First and foremost, I have my parents to thank. My father came from a very, very humble background and achieved a lot. He taught me the value of hard work by taking care of his family. My mother taught me the importance of generosity, being patient, and embracing change and exploration. Some of my earliest entrepreneur training came from my mother and I consider her one of the bravest women in the world having moved from northern India to southern Africa without knowing a word of English. Professionally, the two people who influenced me most were Dr. Robert Troy, and Dr. Alan Baratz. Dr. Troy, the Founder and CEO of Verilog (now part of IBM Rational Division), was a big influence as he taught me what it truly takes to be an entrepreneur and what it is to be a leader. He is the quintessential entrepreneur, a brilliant man, and he taught me some valuable lessons including how you do things right and, more importantly, insights from some of the mistakes that the company made along the way. Dr. Baratz, who brought Java to the enterprise, was the president of SunSoft and JavaSoft under Scott McNealy, really mentored me. He taught me how to be a logical thinker and he was the one who encouraged me to go join a large company like SAP. I had never wanted to work for a big company, but Alan convinced me that it would be the best option for my professional development. He is much more than a mentor and I am honored to call him my friend. Our focus has always been on helping our customers democratize data and the results speak for themselves. For instance, we have a deployment at a 150-year-old bank that has leveraged Paxata to support its digital transformation efforts. Co-headquartered in London and in Singapore, the bank operates in about 46 countries and has about 100,000 employees globally. Leveraging Paxata, the bank was able to transform raw data into trustworthy, actionable business information. As the tool sits on top of the bank’s data lake, any employee who needs to analyze the bank’s data in their work, whether in finance, compliance or risk, can take advantage of Paxata’s easy-to-use and rich interactive capabilities. Not only were they able to understand, transform, and combine complex data from different sources for better analytics and reporting, the bank achieved a significant return on investment in cost savings and in supporting risk and compliance. We are very proud that this is now an enterprise worldwide initiative where Paxata is the platform of choice for the democratization of information across the bank. We are repeatedly praised for helping our clients transform their data into information on demand that then empower their people, processes, and systems to become more intelligent. Our self-service data prep solution helps give everyone the power to intelligently profile and transform data into consumable information at the speed of thought. Interestingly, 80 percent of the effort in analytics exercises is spent on gathering, exploring, cleaning, combining, shaping, and enriching data to make it usable and reliable. 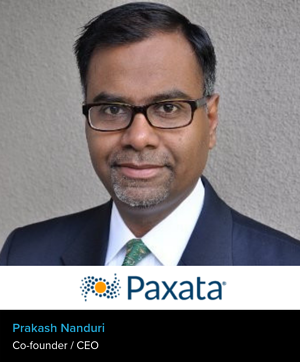 Paxata transforms analytics by removing the critical bottleneck of turning raw data into trustworthy information with an enterprise-grade, self-service data preparation application and machine learning platform. Paxata is a visually-dynamic, intuitive solution that enables business analysts to rapidly ingest, profile, and curate multiple raw datasets into consumable information in a self-service manner, greatly accelerating development of actionable business insights. In addition to empowering business analysts and SMEs, Paxata also provides a rich set of workload automation and embeddable data preparation capabilities to operationalize and deliver data preparation as a service within other applications. The Paxata Adaptive Information Platform (AIP) unifies data integration, data quality, semantic enrichment, re-use & collaboration, and also provides comprehensive data governance and audit capabilities with self-documenting data lineage. Today, leading global enterprises across all industries, including financial services, retail, pharmaceutical, healthcare, technology, as well as the public sector, leverage Paxata to increase analytics speed, quality and volume. With Paxata, business consumers use clicks, not code, to drive insights and unlock business value in minutes, not months. Paxata customers complete analytics and data migration projects 75 – 95 percent faster with dramatically improved accuracy at a fraction of the cost of traditional data preparation methods. In terms of Paxata, we continue to focus on being the leading innovator in the space and to growing the company into a high-growth, scalable business. The transformation we are experiencing is already happening and is apparent in use cases such as the one described above. In fact, this year, we were very fortunate that we were named a leader in The Forrester Wave™: Big Data Fabric, Q2 2018 and last year, we were named a leader in The Forrester Wave™: Data Preparation Tools, Q1 2017. These acknowledgements demonstrate the importance data prep has to meeting today’s mission critical business processes and are in line with where we're taking our customers and where we are growing as a company. Meeting Paxata’s goal of becoming a high-growth, scalable business will require focus and clarity of thought. It will also require us to clearly articulate the goals and inspire a larger team, while at the same time ensure accountability across the organization. Creating technology is the easy part. The hard part is having clarity of thought to determine the drivers that matter to our customers. We take great pride in aligning our people with these objectives and are constantly challenging each other to ask the hard questions such as "What are the real priorities for our customers?” “What are the corresponding priorities for our own business?” “What should we focus on as a business?" And then, "How do we deploy the technology to hit those business priorities?" The same goes for ensuring customer success because the more we scale Paxata in large organizations, the more we find that change management and business priorities are important. Personally, I get excited watching our team members grow into highly dynamic industry leaders. Coming to work and witnessing my team’s development, is very gratifying and is something I am very proud of. Second, is when I see our customers becoming wildly successful and seeing them evolve into an information-driven business.